"Emerald City Life is an adventure and this painting has a little bit of each part of the journey included! Look closely to see a number of vibrant colors, shapes, and textures that take you across the field of poppies and along the yellow brick road of Dorothy's journey across Oz. Dorothy's journey is similar to our own in life - exploring with wide eyes, finding companions to share our adventures, and seeking our home (place) in the world. Give this beautiful Wizard of Oz inspired painting to someone who is ready to take on the world and is seeking great adventures. As it will allow them to stay motivated, and venture to faraway lands while staying true to their roots. So no matter where they go, they will know where they are from. 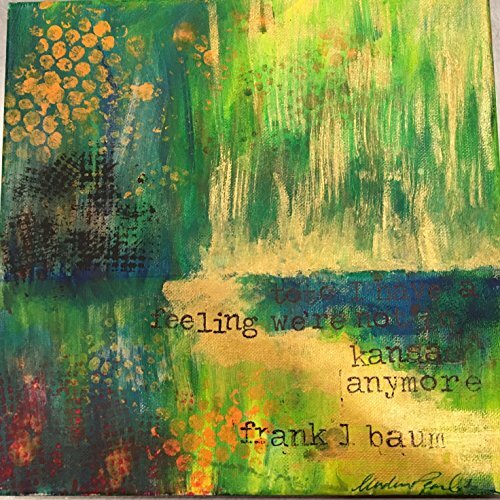 Style: Mixed Media Art Measurements: 12 x 12 inches Quote: Toto I have a feeling we're not in Kansas anymore. Frank L. Baum Bonus: Original art is in a black frame and ready to hang. If you have any questions about this product by Book Pearls Creations, contact us by completing and submitting the form below. If you are looking for a specif part number, please include it with your message.